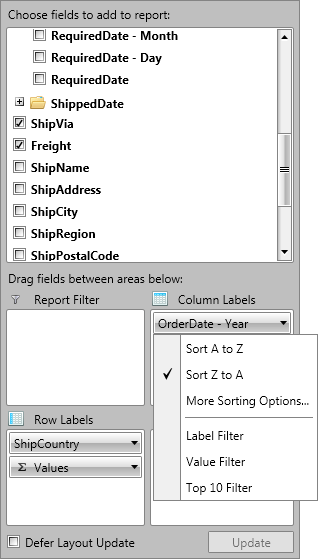 In this article we will show how you can sort your data based on the header names or the totals. 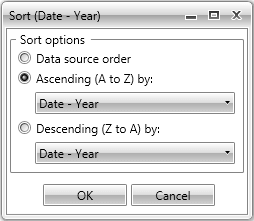 RadPivotGrid provides different sorting capabilities. You can sort your RowGroupDescriptions and ColumnGroupDescriptions ascending (from A to Z) and descending (from Z to A) based on the names of the properties they are showing or based on the aggregated description. With the Q1 2014 SP1 version of Telerik UI for RadPivotGrid provides an additional option. The data can be shown the way it has been received from the data source using the SortOrder property set to None. The sorting is set on the ColumnGroupDescriptions or RowGroupDescriptions. You cannot set sorting on the AggregateDescriptions, but you can sort the columns or rows based on the aggregated values. The sorting can be applied in the XAML, in the code behind or even at runtime with the help of RadPivotFieldList. Note that the SortOrder None property is available with the Q1 2014 SP1 version of Telerik UI for Silverlight. The AggregateIndex property is set based on the count of your aggregate descriptions. 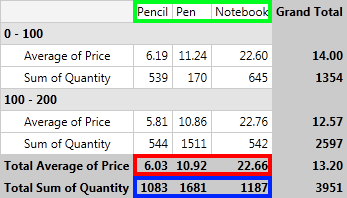 If you have two aggregates the first one will have AggregateIndex = 0 and the second - AggregateIndex = 1.